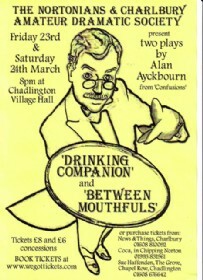 Two classic one act plays by Alan Ayckbourn from his CONFUSIONS collection, jointly presented by CADS and Nortonians. In a hotel bar, a married man flirts with a woman with hilarious consequences. Watch the key! Two couples in a hotel dining room realise an unwelcome common bond assisted by an extremely interactive waiter. 20 Photos. Click thumbnail images to enlarge.